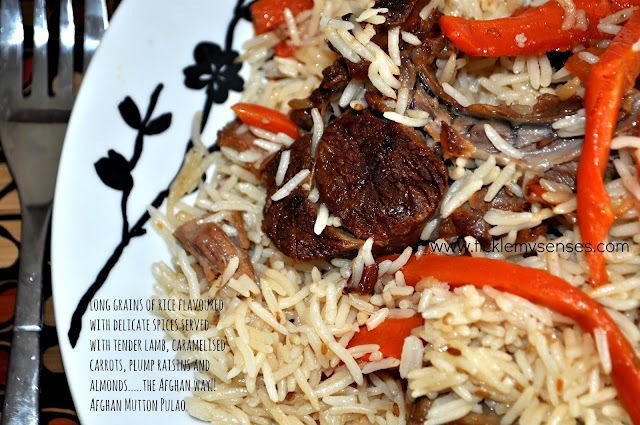 Tickle My Senses: Afghan Style Mutton Pulao, Qabili Palau, Kabuli Palao, Qubuli Uzbaki. 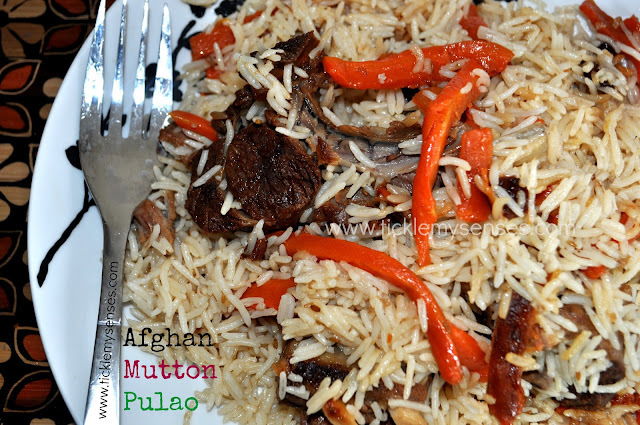 Afghan Style Mutton Pulao, Qabili Palau, Kabuli Palao, Qubuli Uzbaki. Delicate grains of Basmati rice parboiled till tender, then delicately tossed with a rich gravy of browned onions and whole spices, flavoured with the delicious juices of tender lamb or chicken, sealed in a large pot and baked gently and slowly, till the rice is long, fluffy and distinctly seperate, served in a large platter with a lavish garnishing of carrot slithers, plump raisins and crunchy nuts. This dish is a reflection of the country's undeniably unique cuisine with contrasting tastes and food that is neither spicy nor bland. A country where rice dishes are considered the "king" of all foods and are the best part of any meal, a place where certainly reputations can be made in the realm of rice preparation. Do try out this authentic Afghani recipe from Afghanicooking.net. A food blog that is filled with stories of the life, culture and food of Afghanistan. If you would rather not mix sweet and savoury tastes, you might want to give this dish a miss. For all those who love a hearty flavoursome, delicately spiced rice dish, this one is not to be missed. Recipe Adapted to make Lamb Palao. Ground cardamom: 1 ½ tsp. 1. Wash rice several times remove starch then let it drain in a colander. 2. Wash the cut meat and allow to drain in a colander. 3. Dice the onions finely. Choose a wide pan (non stick preferably) that is at least a couple inches deep and large enough to fit all the meat. Pour the oil in the pan and saute the onions over high heat, stirring quickly, until golden brown (5-10 minutes). Don't allow the onions to burn. 5. Next add the ginger garlic paste and fry for 2 more minutes, then add the drained meat and cook the meat over medium-high heat for 6 minutes, turning from time to time so all sides turn golden brown. The onion will start to caramelize and begin to turn into a thick sauce. 6. Add enough hot water to just cover the meat, let it come to a boil then cook the meat on a very low flame till the meat is tender and cooked (may take 35- 50 minutes to an hour). Check 2- 3 times in between, so as to not allow meat to burn, add more water if required to cook the meat. Once the meat is cooked, seperate it from the brown gravy and keep aside. If the gravy is runny allow the gravy to slightly thicken open on a medium high flame. The sauce should turn a dark brown. If your sauce does not take on a dark color you can add the Kitchen Bouquet to give it color. Once the gravy has thickened stir in the cumin, cardamom and black pepper powders into the gravy. Continue to cook on low flame for a further 5 minutes. If you would prefer a more spicy gravy add more powdered pepper. Turn off the fire. Keep aside. While the meat is cooking, cut the carrots into long matchsticks, about 4 inches long and 1/4-inch thick. Make sure that they are not too thin. In a large frying pan add ¾ cups of water and bring to a boil, add the carrots and cook until tender and a deep orange hue, 5 to 7 minutes. Keep a close eye on this to make sure you do not overcook them. Once the carrots are done, drain any leftover liquid out of the pan. Add the remaining 2 tbsp of oil, raisins, almonds and sugar to the carrots. Stir fry quickly over medium-high heat and keep stirring for about 3 minutes. The raisins will look plump; the carrots will take on a nice sweet flavor. Remove from heat and package the carrots mixture into a sealed aluminum foil pouch about the size of a small paperback novel. 8. To make the Rice. Measure 12 cups of water in a large pot with a fitted lid. Add salt to taste. Bring the water to a boil. Add the rice to the water and boil until it is al dente (80 percent cooked, though still slightly crunchy). This will take just a few minutes depending on the rice you use. You will have to taste it to check for doneness. Do not overcook it. Drain the rice and put the rice back into its cooking pot. To it add the thickened lamb brown gravy. Coat the rice gently with the gravy. 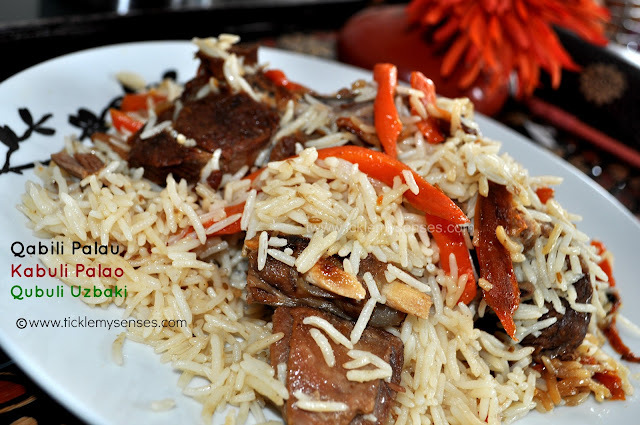 Arrange the cooked meat pieces on top of the rice. Try to cover the meat pieces with the rice. Set the closed aluminum package of carrots on top of the rice. This will keep the carrots warm and deepen the flavors without mixing with the rice yet. Make holes through the meat and rice using the back of a wooden spoon .Cover the dish with 2 sheets of aluminium foil and then place a lid which covers the pan completely. 9. Place the dish in the centre of a preheated oven at 500F/250C (temp given is for a conventional oven, adjust temp accordingly for fan-assisted oven) and bake for 15 minutes. Then drop the temperature down to 250F or 120C (temp given is for a conventional oven, adjust temp accordingly for fan-assisted oven) and bake for another 20 minutes. 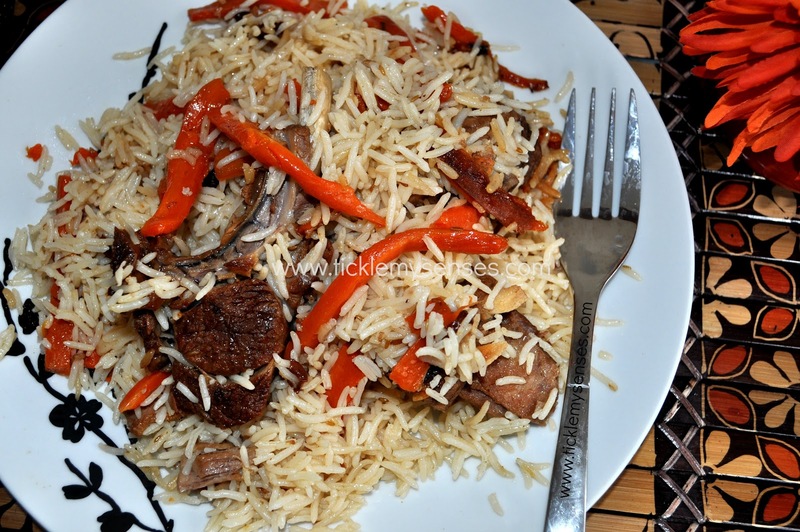 Arrange the meat pieces on a large platter, cover with the rice. Sprinkle the carrots, raisins, and almonds on the rice. Serve with a simple salad. 1. The meat in this dish can be substituted with Chicken. 2. I used lamb chops but you could substitute with any tender cut like the shoulder of lamb. 3. Most recipes I went through online for this dish asks for the carrots to be fried in lots of oil, in this version the carrots are precooked in water first then quickly stir fried in a little oil, making it healthier. I hope you do try this recipe and enjoy it. Would love to know your thoughts on it. My husband loves this pulao. Yours looks delicious.